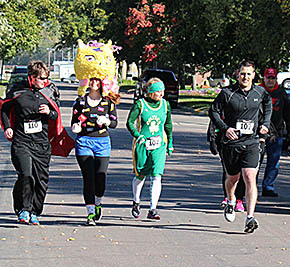 Some creative costumes were featured by participants in the annual ‘Scary Scurry’ run sponsored by the Boone County Fitness Center last Saturday. Above, some of the adult runners leave the starting line for their 5K run. Costume winners in the children’s division wre Xander Wright (Captain America), first, and Carley :Beckwith, second. Winners in the adult division were Kate Kusek, first; Andy Devine, second, and Renita Karmann, third.